The spice people carry these fennel products; fennel seeds ground and fennel seeds whole. 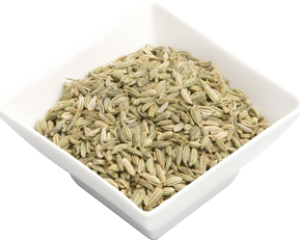 Fennel seeds whole are obtained from the aromatic and tall fennel plant, which originated in the Mediterranean and are member of the caraway family. It is a highly aromatic and flavorful herb with culinary and medicinal uses and, along with the similar-tasting anise, is one of the primary ingredients of absinthe. Florence fennel or finocchio is a selection with a swollen, bulb-like stem base that is used as a vegetable. The seeds release strong anise flavour that is warm and breath freshening. It is key ingredient of the Chinese five spice and Herbs de Provence. Use to make breads and cakes especially fruit tarts. It goes well with lentils, potatoes, stews, herb butters, dips, fêta cheese and olives. Fennel contains vitamins and has many health benefits. It can help to treat coughs and asthma. It also can be to aid digestion. It contains Vitamin C and Vitamin B.